MODEL NCH45 - The Carrington - POPULAR! A beautiful example of a handcrafted double tiered Victorian gaslight reproduction. 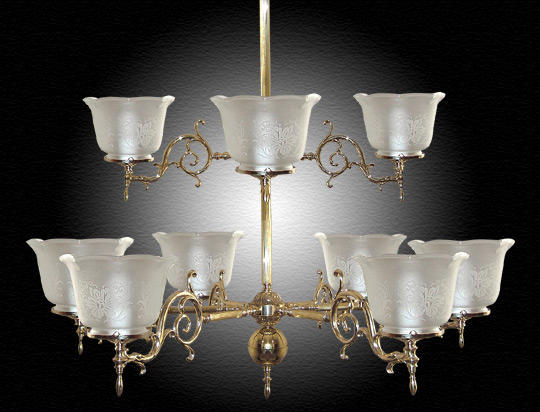 Most of our chandeliers and hanging fixtures can be made into multi level models. The Carrington features heavy cast, Italian brass arms, along with Italian reeded brass tubing (smooth tubing also available at your request). Simply stunning and elegant in any formal setting. They'll be talking about this one! Many other Custom Options available! Imagine this stunning piece of art hanging above your two story entryway. Offers plenty of light with 10 sockets with up to 100 Watts each.